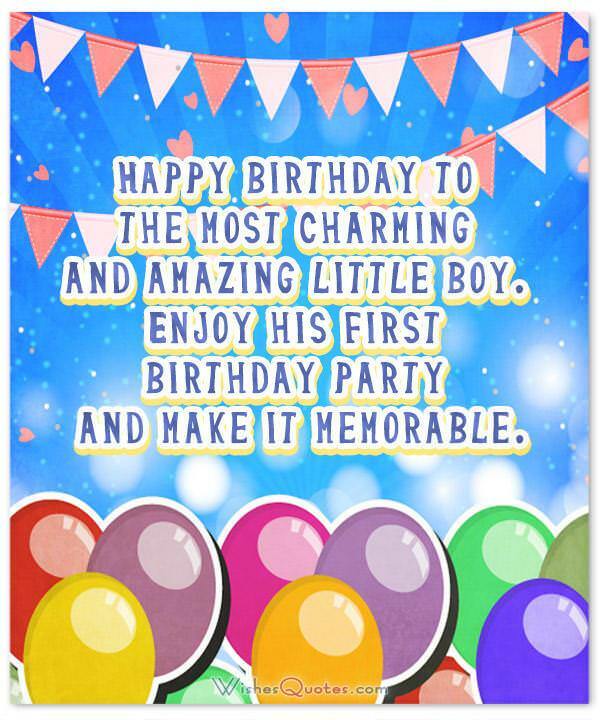 WishesQuotes » Birthday » Wonderful Birthday Wishes for a Baby Boy. Happy Birthday, Little Boy! Wonderful Birthday Wishes for a Baby Boy. Happy Birthday, Little Boy! 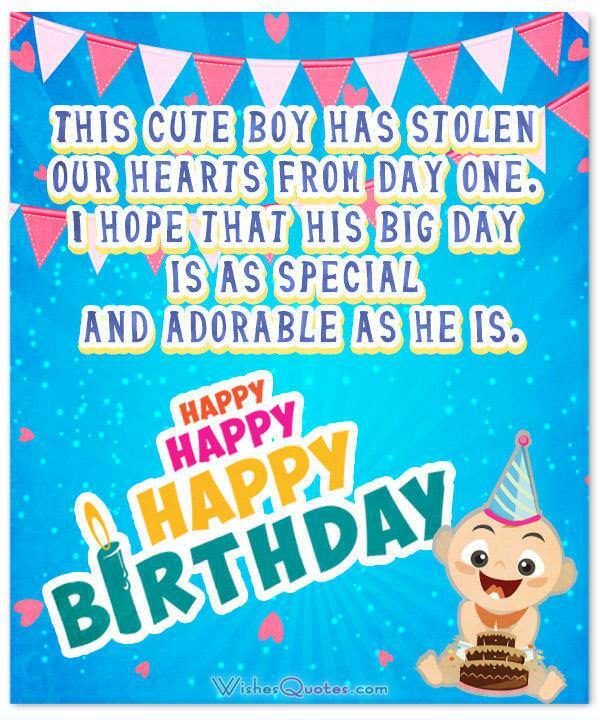 Browse through our heart melting collection of the best birthday wishes for baby boys on the internet! We all know a little boy that drives us crazy every time we see him. As all baby boys are, he probably is full of energy, always laughing, and constantly being loud. It could be your beloved son, or a member of your family, or just generally the child of one of your friends, but the only certain thing is that this kid deserves all the praise and adoration in the world. And there is nothing better to do this with, than an amazing wish on the very special day that is its birthday! 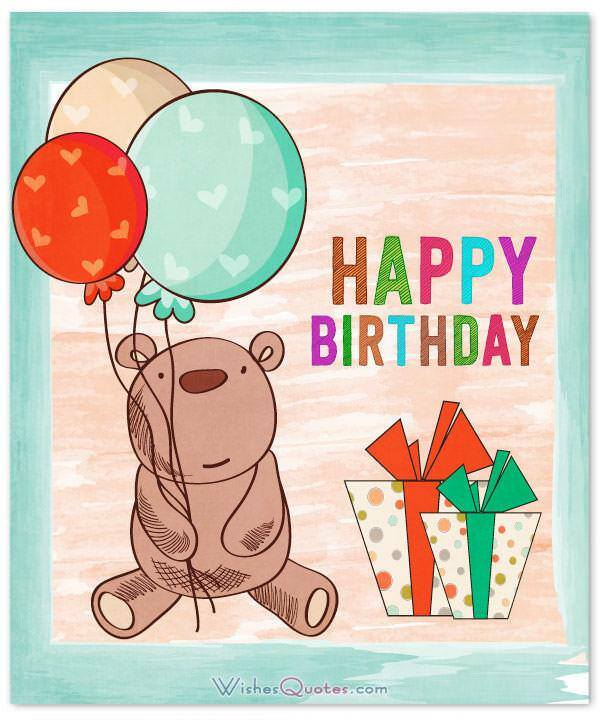 So, here you go, we have provided you with the best birthday messages and greeting cards available to show that little baby boy and his parents you care! Happy birthday to your adorable boy! He is the most wonderful gift you ever received! This cute boy has stolen our hearts from day one. I hope that his big day is as special and adorable as he is. This adorable baby is the most wonderful gift to his parents! I wish the birthday of the most handsome boy in the world to be as sweet as honey. It is the first birthday of the cutest daddy’s mini version. On his special day, we wish him nothing but the brightest and the happiest future. Happy birthday to the most charming and amazing little boy. Enjoy his first birthday party and make it memorable. This cute baby has brought so much love and happiness into your lives. May he enjoy all the gifts and cake! 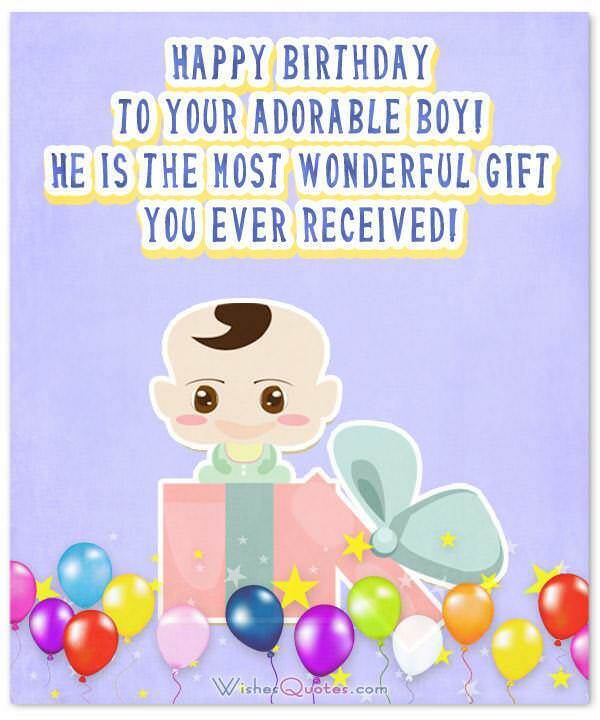 I wish the happiest birthday to your darling baby boy! You’ve shown me in many ways the joy of being a parent and the majestic feeling of loving someone more than yourself. I love you my little prince, happy birthday! When you are in the house, it’s not easy for anybody else to get some rest, but least with you around, nobody gets bored! You are a gift to my life, and for that I thank you. Happy Birthday! Your mom and I will do our best to give you the life that you deserve. We love you so much. 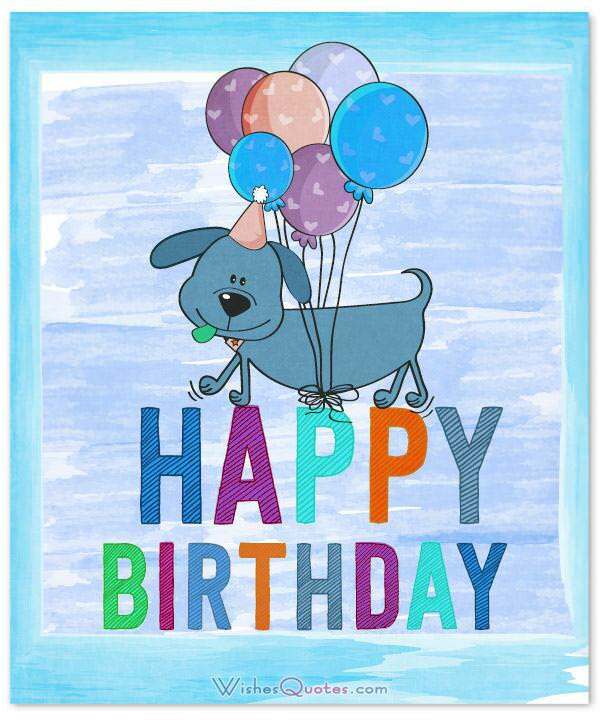 Have a fun-filled birthday! If this was a fairy tale I’d call you my prince if this was a move I’d call you my hero, but this being a real life I’ll call you something even better, my son. I love you more than words can express. Happy Birthday! Ever since you were born, I have found a new reason to get out of bed every morning, and for that, I thank you! Happy Birthday! Being a parent isn’t easy, but seeing your lovely eyes and cute little face every day makes it all worth it. I truly hope that one day you grow up to accomplish all of your dreams, so I can be even more proud of a parent than I already am! Happy Birthday! The day I saw you for the first time, was hard proof that I can love someone more than I could ever possibly love myself. You are a blessing in my life. Happy Birthday! Watching you grow up is like witnessing the marvels of nature unfold right in front of me because this is what you are my friend and extraordinary marvel of nature. Happy Birthday! Never before has devoting your life to a person been so fun and fulfilling, and you, my dear son, deserve it all! Happy Birthday! Getting to raise you have been the best thing that has happened in my life, and I can’t wait for you to get old enough so I can say it to you in person! Happy Birthday! There are no words to express my never-ending love for you my dear son. You have taught me many things, and I am sure that you are about to teach me many more. You made me a parent, but most importantly, you made me happy. Happy Birthday! I can say without a doubt, that you are the best thing to have ever happened to me. You are the person that makes my life worth living. Thank you, and happy birthday! You may keep me up at night with all of your needs, but the smile you give me after you’re satisfied can help me through any sleepless night. I love you, Happy Birthday! If I could have one wish in this world, it would be that you, my lovely son, achieve all of your dreams and goals in life, so then I can be right beside you, looking at you as proudly as I am looking at you now. Happy Birthday! There is not a single star in the sky, that shines brighter than your smile, not a single drop of water in the sea more crystal clear than your eyes, and not a single drop of lava in the earth warmer than your heart. You are a marvel of nature, an exemplary child, and most importantly, my beloved son. Happy Birthday! Ever since you were born, you have been an amazing child, capable of amazing things. I cannot imagine how proud your parents must be feeling about you! Happy Birthday! It is rare to see a child as amazing as you being born, you truly give me hope that mankind can progress when such smart and extraordinary people get born! Happy Birthday! For the next 24 hours, you get to be the king of the world young man. So, you have to choose, how will you spend the day strolling around your kingdom? No matter what you do, I bet it’s going to be fun! Happy Birthday! If this day was an object, it would be a door, leading you to new adventures, that you will now face, one year older, one year wiser. Happy Birthday! For every candle you blow out today, I’d like a wish of yours to come true! You deserve every little spec of awesomeness in this world. Happy Birthday! Just by being in the room, you make everyone around you happier, which is something that extremely hard to do, yet you accomplish it so naturally! I always knew you were amazing! Happy Birthday! You now have one day dedicated entirely to yourself! I want you to spend it wisely because you only get one of these per year! But, you need to know, that no matter what you choose to do, everyone will be there to support you! Happy Birthday!